(Newser) – A clearer timeline of the Las Vegas shooting is coming into focus, though exactly what Stephen Paddock was up to during the 72 minutes between the first 911 call and the time officers entered his suite at the Mandalay Bay Resort and Casino is still taking shape. NBC News reports the first 911 call came at 10:08pm local time, just as a police officer on the scene raised the alarm: "We got shots fired, sounds like an automatic firearm," the officer said over a police radio channel, per the New York Times. Less than a minute later, an officer described shots as "coming from upstairs in the Mandalay Bay," per the Times. 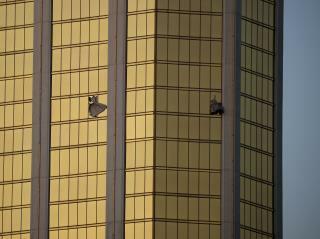 Within minutes, an officer who'd reached the 31st floor of the 43-story Mandalay Bay commented that he could hear "automatic fire coming from … one floor above us." Now they are saying the security guard was shot 6 minutes before the gunman opened fire on the concert goers. Yet the first 911 calls appear to address only the gunman firing into the crowd. If a security guard is shot in a hotel, isn't 911 notified immediately that there is a live shooter in the hotel shooting through doors? Even with a bump stock. this guy would have had to practice a lot to get it to work that good. and at 500 rounds per minute, he would have to change his clip like every 5 seconds..